Automotive technicians these days are required to be trained in computer diagnostics and not just basic vehicle repair (power steering systems). In fact, a qualified technician must have a complete understanding of computer diagnostic equipment to accurately and adequately service, repair, and maintain a vehicle. Accurate Tune Plus’ team of technicians have a thorough understanding of computer technology and diagnostics, as well as the latest tools to perform the extensive computer diagnostics work. Norfolk, VA area drivers count on Accurate Tune Plus every day to perform computer diagnosis on all makes and models of cars and trucks. At Accurate Tune, we have a strong belief that the driver or car owner should have a complete understanding, and detailed explanation of all recommended repairs before any work is done. When a customer is kept in the loop of everything that is going on with their automobile, they are best equipped to make smart and informed choices about their auto repair and automotive maintenance needs. Our technicians take the time to review the computer diagnostics to help drivers in this regard. What about when the check engine light is not on? Even though late model cars have a fairly complex computer operating system that communicates driving data and engine operations from the dash to the engine and back. Drivers can’t solely rely on the check engine light, they need to be aware of how their car is driving from day to day. 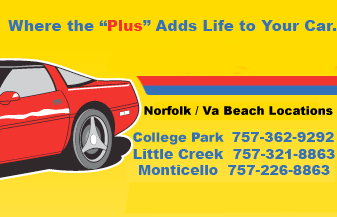 If your automobile is driving rough, or your check engine light is on, you should immediately bring your car or truck to one of Accurate Tune Plus’ four area locations serving Virginia Beach and Norfolk for computer diagnostics. When a car’s check engine light is on, hooking up to a computer diagnostics machine will generally reveal the source of the problem. Our technicians can easily tell if the problem is coming from an electrical issue, a bad sensor, or a faulty mechanism in the automobile. Even if the check engine light doesn’t come on, our expert automotive repair technicians have the experience to use other methods to diagnose the automotive problem. It’s precisely because of our experience and reputation that local residents have been trusting their vehicles to us for many years. The Right Computer Diagnostic Equipment? The automotive technology that runs the computers in cars and trucks is constantly being improved and upgraded, for this reason not all computer diagnostic equipment is capable of diagnosing all vehicles. Accurate Tune Plus has the necessary tools and equipment to employ computer diagnostics on most vehicles, and if by the off chance we don’t, our expert staff has the experience to make up the difference.